You’ve decided you want to gamify some aspect of your business to achieve a specific result. Your next step is to determine just how to implement gamification. To aid in this, six various gamification frameworks have been identified. These frameworks provide a path for getting up and running with a gamification program and help accelerate the aim of the program targeted to achieve a specific goal. Each of these frameworks responds to a specific business objective, using specific mechanics to help drive the behaviors that pertain to that objective. Think of frameworks as being like blueprints for building a house. You could try to build a house out of a pile of lumber and supplies, but a blueprint makes the job much easier. The advantage of the blueprint is that it is written by an expert — someone who has built many houses. It guides you through the overwhelming task of building. A gamification framework is a holistic program designed to achieve a specific business objective. The framework you use depends on the outcome you want to achieve. As you might expect, you have many options in terms of gamification frameworks. Six broad framework approaches are listed. As mentioned, each gamification framework is designed to address a specific business need. Some of these frameworks are designed to address an internal (employee-facing) need, whereas others are designed for external (customer-facing) use. Some frameworks work best in solo environments (for an individual); others are ideal for collaborative settings (for a community); and still others speak to competitive arenas (say, a gaming site). 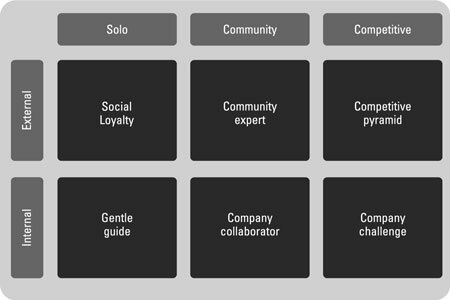 Social loyalty: This framework is for customer-facing experiences that occur in nonsocial environments, such as a traditional e-commerce experience. This framework focuses on gameplay rewards. Community expert: This framework is for customer-facing experiences that rely on quality user-generated content and contributions. This framework focuses on gamer reputation. Competitive pyramid: This framework is for customer-facing communities that seek to motivate competitive behavior. This framework focuses on gamer status and score. Gentle guide: This gamification framework guides employees through a process. This framework focuses on ensuring completion and compliance. Company collaborator: This framework is designed to increase contributions by employees, developers, and partners in internal communities. Company challenge: This gamification framework is designed to challenge your staff to compete on teams to encourage high-value behaviors.